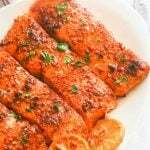 Oven Baked Salmon – moist and flaky highly seasoned salmon fillets with a lemony and spicy kick. A perfect easy weeknight meal for busy folks or as a low-carb go-to Lenten meal. 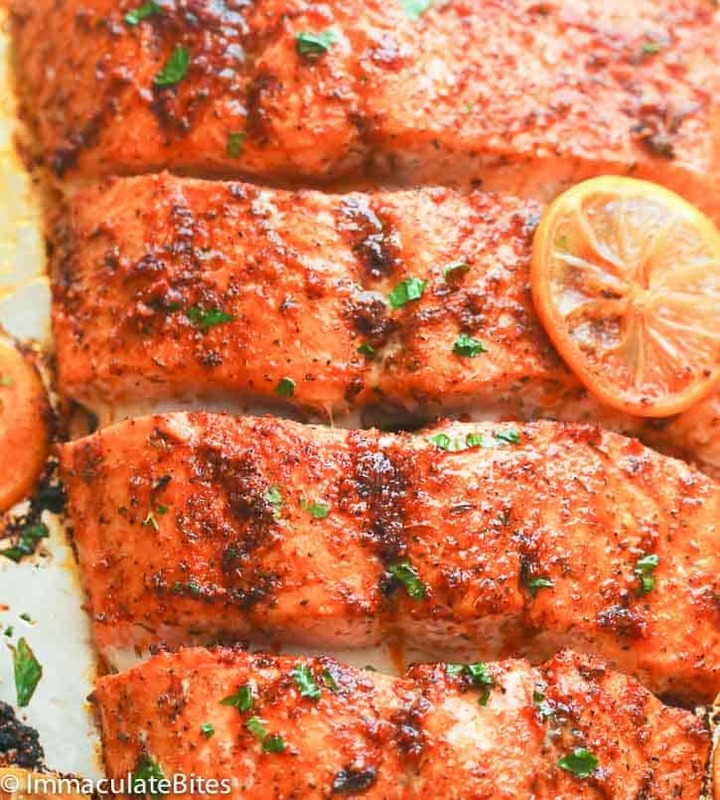 Spicy, lemony, and moist – everything you want a salmon dinner to be! The closest recipe that I can think of to this one is this popular Paprika Salmon and Green Beans, but it’s better than that. Oh yesss! Let me tell you why. 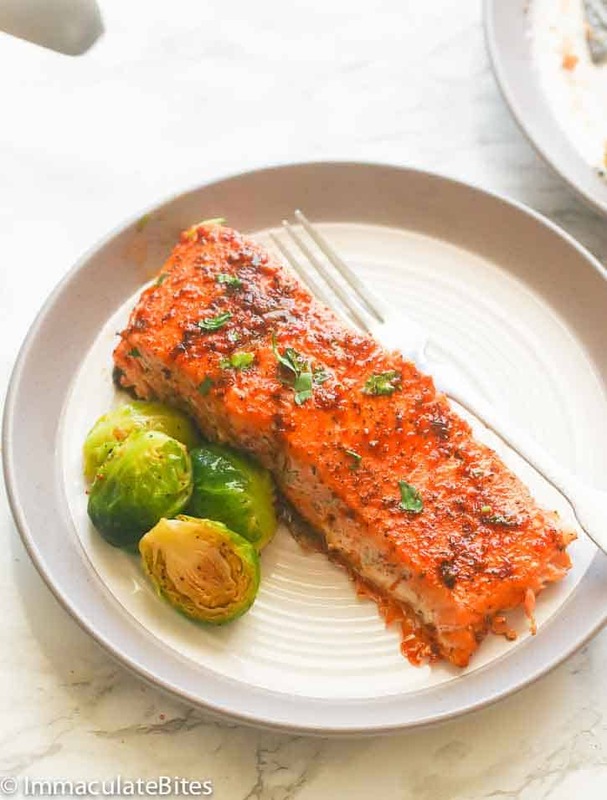 Aside from the herbs and spices like paprika, cayenne pepper, thyme and basil, among others, this Oven Baked Salmon here is doused with butter and also the vibrant flavor of lemon. Oh I’d never leave my lemons for this recipe especially now that they’re in season. Just one of the many reasons why I love LA! That lemony kick is a must on most of my savory dishes especially when dealing with meat and sometimes with my sweet treats. I’m all down for anything with lemons. Seriously! The thing with lemon though is that also helps achieve a moist flaky salmon inside and out. A beautiful and easy perfect weeknight go-to meal or midweek fancy date night protein. 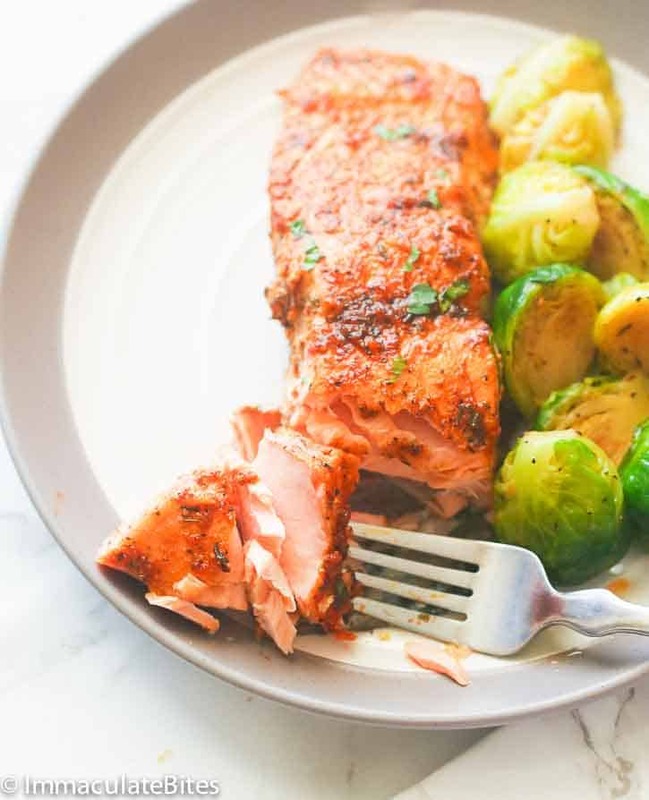 There is so much flavor sitting atop on these salmon fillets that you can serve it with other veggies (like some roasted brussel sprouts) or simply enjoy it as it is. Take note though that cooking times must be adjusted depending on the thickness of the salmon cut. The US Food and Drug Administration recommends an internal temperature of 145 F to determine that a salmon is cooked enough. You can use an instant read thermometer inserted onto the salmon or do the fork testing. Insert a fork into the center of the fillet and slightly twist it. If it comes flaky, opaque and moist, then you’re all set. Position a rack in the center of the oven and preheat the oven to 400ºF. Line a baking sheet with foil or baking paper, like I did, spray with cooking spray or lightly oil. Set aside. Using a sharp knife, make about 4-5 slits on salmon. Dab both sides of salmon dry with paper towels, season both sides with salt and pepper. In a small pan set over medium low heat butter, minced garlic, Paprika, onion powder cayenne pepper and parsley or basil. 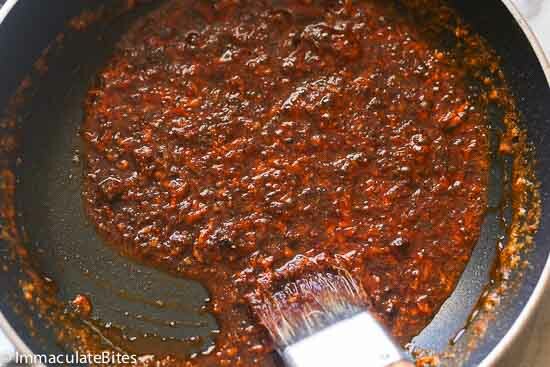 Stir for about 30 seconds or 1 minute. Let this mixture sit for a little bit about 5 minute. Add lemon juice to mixture. 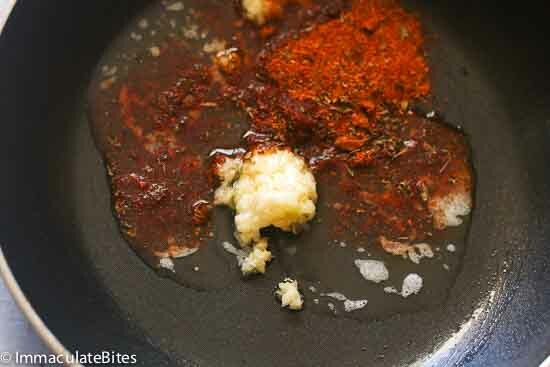 Brush salmon with spice mixture, making sure every inch is covered with spice . Bake until cooked through, about 10-15 minutes, depending on the thickness of your fish and your preference of doneness. When the thickest part of the salmon is easily flaked with a fork, the salmon is perfectly cooked. Garnish immediately with lemon slices. Position a rack in the center of the oven and preheat the oven to 400ºF. Line a baking sheet with foil or baking paper, like I did, then spray with cooking spray or lightly oil. Set aside. 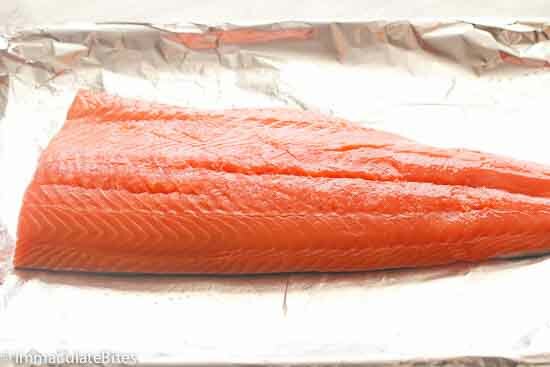 Using a sharp knife, make about 4-5 slits on salmon OR you can slice it through after cooking. Dab both sides of salmon dry with paper towels, season both sides with salt and pepper. In a small pan set over medium low heat butter, minced garlic, smoked Paprika, onion powder cayenne pepper, parsley or basil . Stir for about 30 seconds or 1 minute. Let this mixture sit for a little bit about 5 minute. Add lemon juice to mixture. Brush salmon with butter mixture. Bake until cooked through, about 10-15 minutes, depending on the thickness of your fish and your preference of doneness. When the thickest part of the salmon is easily flaked with a fork, the salmon is perfectly cooked. Adding my stars. Somehow I missed that part during my 1st review! If I could give 10, I would! Excellent! I think I died and went to heaven. It was all I could do to not eat the whole 2 pounds! Possibly the best salmon I’ve ever had. In fact, I was beginning to not like salmon and haven’t been ordering it because it is either not seasoned to my liking or is way over cooked. And I tend to over cook mine as well so I was ready to throw in the towel. So glad I came across your blog and this recipe. 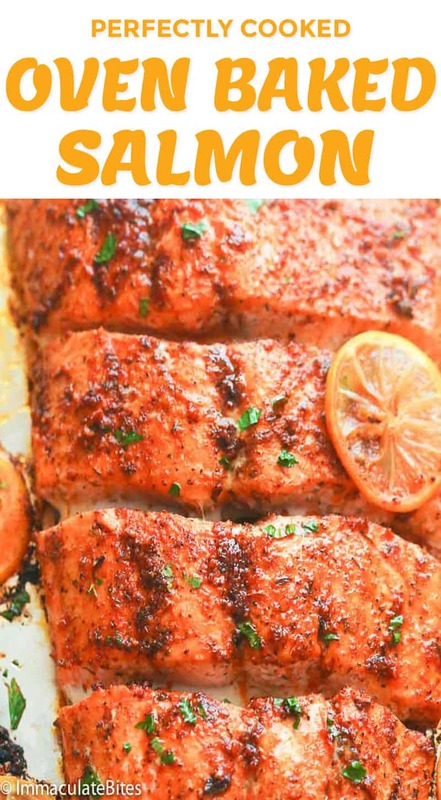 So easy and possibly the tastiest and flakiest and moistest salmon I’ve ever eaten or made. This is a 5 star restaurant quality recipe!! Printed and going to the top of my dinner lists. Made this today for lunch over a beautiful spinach and Romain salad with a drizzle of EVOO and ACV. It was picture perfect. Snapped it to my friends and forgot to download it. Gone into the Snap Chat world forever. Oh, I have cut out butter from my diet so I used 2 TBS coconut oil and 2 TBS EVOO. I used my glass Pyrex pans, drizzled some olive oil on the bottom of the pan and sprinkled salt and pepper on the bottom of the pan. Laid my salmon fillets (skin on) in the pan, sprinkled some more salt and pepper on top of the fillets and followed the recipe exactly thereafter. Baked for 15 minutes (thick filets). Skins peeled right off the fillets. I wish my family liked fish. This was literally to die for. Sharing the recipe with EVERYONE!! 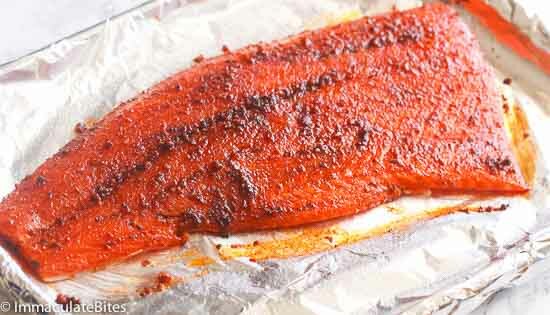 My husband always makes smoked salmon so I decided to try this recipe and it was delicious! My granddaughter said it was the best salmon she has ever had. Thanks! This has become my go-to baked salmon recipe that I make probably once a week. It gives the fish a ton of flavor that even my picky fiance will eat. Accompanied with a vegetable of choice (normally broccoli) and you have yourself an easy dinner. Just place it all in the oven, watch your favorite show and dinner is ready with minimal dishes in 30 minutes! That is my kind of weeknight recipe. Thank you for sharing! I loved this recipe!! I am Mexican so I love how it has a nice kick to it and the lemon, everything was delicious! Cooked it tonight for my moms birthday, she loved it, very quick and easy to make. Thank you so much for sharing your recipe!! 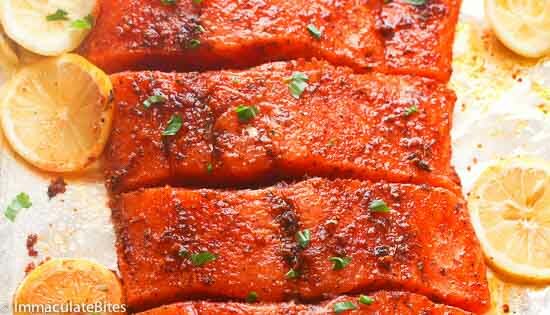 This salmon recipe is amazing! My kids’ thumbs shot through the ceiling in approval, they loved it and made me the popular parent tonight . I accompanied with grilled veggie kabobs and couscous. Thanks for sharing this! Made tonight, easy and delicious. Thank you. Delicious, quick and easy!! Thank you! This will be my go to weeknight meal from now on! Wow I’ve never left a review on a recipe. This one is really worth it!! Thank you it was awesome and I will definitely make this again!! I like that you can enter how many people you’re making it for and the recipe adjusts. If I could give more stars than 5 I would. It doesn’t disappoint. Delicious. 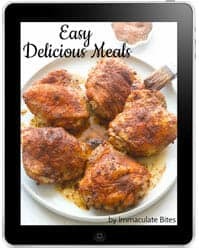 Quick, easy directions and simple steps with complex flavors! 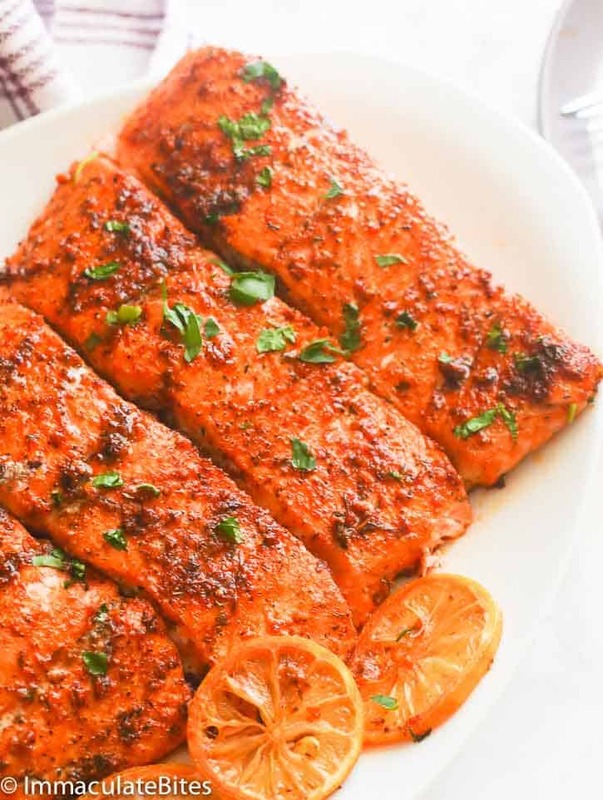 I just want to say oh my God I came across your website while searching for a recipe and at first I was hesitant to try your oven baked salmon but, when I looked at all the reviews everything was nothing but compliments how great it is. I made for dinner, let me just say it smell and it taste as delicious as it looks. Looking forward to trying more of your recipes.Thank for your amazing recipe . Thanks for this easy, tasty, wonderful recipe! Awesome! Happy to hear it worked out well for you. The video has like 20 commercials.. I made this tonight and it was AH-MAY-ZING!! My husband and I enjoyed it. I used fresh parsley and added some dried basil. Oh, soooo yummy! Thank you!! I know, I will make this again when my children come for dinner. Again, thank you for this wonderful and yummy recipe.